Among authors frequently adapted for film and television, Keigo Higashino is approaching the lofty, bankable heights of Stephen King and Agatha Christie. American viewers are most likely to be familiar with gritty thrillers based on his work, such as Into the White Nights and the South Korean Broken. It is hard to believe the same pen inspired this light-hearted family caper, but imdb and wiki wouldn’t lie, would they? 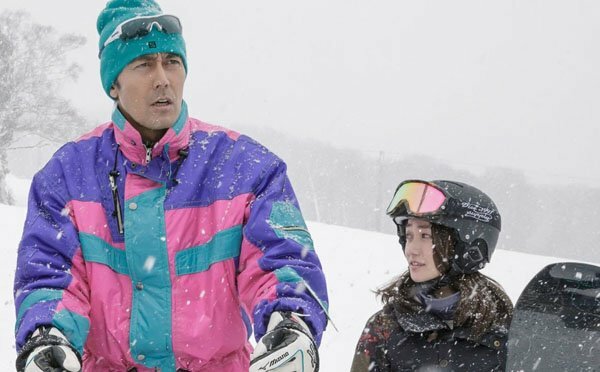 Regardless, a widowed father is in for a rough skiing outing when he tries to recover a lost canister of super anthrax in Teruyuki Yoshida’s Shippu Rondo (trailer here), which screens during the 2017 Japan Cuts Festival of New Japanese Film in New York. Chief researcher Kazuyuki Kuribayashi was caught flat-footed when he learned his boss Masaomi Togo allowed an unstable colleague to develop the lethal K-55. To make matters worse, he takes the bio-weapon with him after he is finally fired for being nuts. He had intended to extort money from his former employer, but he is killed in a freak accident shortly after sending his demands. Of course, the shtickily loathsome Togo will not go to the authorities, so that leaves the put-upon Kuribayashi to recover it. All he has to go on is a transponder frequency and the photo sent by the late mad scientist of a teddy bear apparently marking the hiding place, somewhere out of bounds at a large ski resort. At least his petulant middle school son will get a ski trip out of his dad’s troubles. He also might be able to hep more if Kuribayashi would start trusting him. Yes sir, lessons will be learned by everyone during the course of Shippu, but that’s not necessarily a bad thing. Most of the cast is rather pleasant to spend time with and there are some decent skiing/snowboarding chase sequences to its further merit. Hiroshi Abe, who has the flexibility to star in Kore-eda family dramas and the Thermae Romae franchise, has plenty of aw shucks charm, but still manages to project a sense of the widower’s sadness. Tatsuomi Hamada and Sayu Kubota have way more charisma than you would expect as his son Hideto and Ikumi Yamasaki, the local girl who befriends him. Tadayoshi Okura and Yuko Oshima handle the action well enough as the ski patrol member and prospective Olympian who volunteer to help Kuribayashi. However, there is no getting around the pain of watching Akira Emoto mug and guffaw as the embarrassing Togo. In a way, it is sort of depressing a mostly pleasant, completely family-friendly film like this has absolutely no chance of getting picked up for distribution outside of Japan. We’re only interested in films with violent, provocative content. Therefore, if you want to see it, you’d better see it now. For us, it is especially interesting to place it in the context of other Higashino films we have seen or expect to cover shortly. If anyone is sufficiently enterprising, a Higashino retrospective would certainly make for rewarding viewing. In the meantime, the ultra-nice but hardly spectacular Shippu Rondo screens this Saturday noon (7/22) at the Japan Society, as part of this year’s Japan Cuts.